Disclaimer: The following article is a part of The Bombers Revisited series, taking a speculative look at the time period between Ocarina of Time and The Wind Waker. 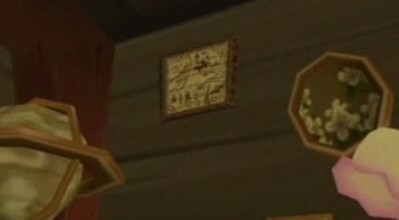 Aside from the given backstory of The Wind Waker, little is officially known about the intricacies of this time period. This article is not intended to be an explicit theory, but rather a means to get people thinking about the possibilities, and how minor details fit together. With that out of the way, please enjoy. The Wind Waker has a vast backstory, full of destruction and despair, contrary to friendly art style of the game. Although the time between Ocarina of Time and The Wind Waker are only briefly mentioned in the introduction, there are many subtle hints scattered throughout the Zelda series. These clues can piece together a picture of what may have happened to Hyrule and its ancestors. This speculative look at the minor details will reveal a complicated world of turmoil and confusion, giving The Wind Waker a far more profound story than it appears. ”So, before the sealing of the kingdom, the gods chose those who would build a new country and commanded them to take refuge on the mountaintops. Those people were your ancestors. Daphnes confirmed The Wind Waker took place hundreds of years after Ocarina of Time, which can mean anything from 200 to 900 years. This leaves a vague timeframe, but before interpreting this period, time itself must be analyzed as expressed within the series. Because there are no definite clocks or calendars within the game, the main reference to time is life expectancy. 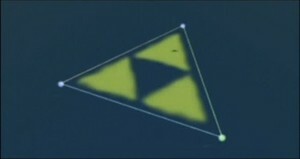 Initially, life expectancy within the Zelda series was difficult to estimate, until Spirit Tracks. Developers were very precise with Spirit Tracks, confirming several times the title takes place exactly 100 years after Phantom Hourglass. Keeping this time frame in mind, Spirit Tracks also reveals its generation gap. Zelda, from Spirit Tracks, explains to Link that her grandmother played the Spirit Flute to her when she was an infant. She later calls her grandmother Tetra, suggesting three generations within the 100 year timeframe. This is also supported by Linebeck III, indicating three generations. However, there are a few other factors still to be considered before predicting an accurate life expectancy. In order to keep everything simple, round all the years to the nearest tenth. Tetra’s age can be a strong indicator of time. She was well on her way to adulthood soon after Phantom Hourglass, and she had to survive long enough for her grandchild to know her. In The Wind Waker, Tetra would be approximately 10 years old, since adulthood in the Zelda series is closer to 20. In Phantom Hourglass, Tetra is portrayed in a similar style as The Wind Waker, so she can still be considered 10 years old. Then the 100 year Reconstruction Era of Spirit Tracks begins. Zelda, from Spirit Tracks, is portrayed at a similar age to Tetra, during The Wind Waker, so consider her 10 years old as well by the beginning of Spirit Tracks. In order for Tetra to meet her granddaughter she had to live through at least 90 of the 100 years, plus the 10 years prior to the Reconstruction Era, making Tetra’s lifespan approximately 100 years. This large lifespan makes it impossible to fit three full generations into a 100 year time period, so the second generation must have died young. If Tetra lived 100 years, then Zelda’s mother must have died young, considering she is never mentioned in Spirit Tracks. The only reason she is known is because Tetra is a grandmother. Zelda mentions Tetra playing the Spirit Flute to her at a young age, which suggests Tetra played an important role in raising her, perhaps due to the absent mother. This also explains why Princess Zelda inherited the kingdom at such a young age. There is no King or Queen present, indicating after Tetra and the mother died, Zelda was the only one left to govern Hyrule. So perhaps Zelda’s entire lineage can fit into the 100 year timeframe, indicating a 100 year life expectancy. Niko is the only remaining original cast member from The Wind Waker, which contradicts the 100 year life expectancy. In The Wind Waker, Niko can be considered an adult, making him approximately 20 years old in both The Wind Waker, and Phantom Hourglass. Spirit Tracks is 100 years later, making Niko 120 years old. This is a significant difference from 100 years, and suggests Tetra may have died young. Since Niko is still alive after Spirit Tracks, his lifespan could last even longer. But Niko was still very old looking. He was too old to go outside, not even for stamps. Link may have lived with Niko to help take care of him and his property. It would seem Niko does not have much longer to live, but without a known lifespan, there cannot be an accurate life expectancy. But based on all this information, life expectancy could approximately be 100 to 150 years. This range nicely includes both Tetra and the potential lifespan of Niko, but ignores all untimely deaths caused by outside forces. With an estimated life expectancy, it can now be applied to the Reconstruction Era of The Wind Waker. In the adult ending of Ocarina of Time, Hyrule is in utter ruins with its people scattered, and Hyrule Castle destroyed. Since the old location of the castle was turned into a pit of lava, the Temple of Time, the biggest surviving structure, was remodeled into the new Hyrule Castle. This would explain how the Master Sword is secretly located beneath the castle in The Wind Waker. Since the new castle was such a bigger structure than the original, it probably took many years to build. Spirit Tracks had a comparatively similar Reconstruction Era. When Tetra first arrived at the soon to be new Hyrule, she and her crew had less than 100 years to build a new Hyrule Castle in time for Spirit Tracks. It would take Tetra, at the most, 90 years to build the new Hyrule Castle, which is still well within her lifespan. Despite the conditions after Ocarina of Time, ancient Hyrule still had plenty of resources, and merely remodeled an existing building, rather than starting from scratch like Tetra. 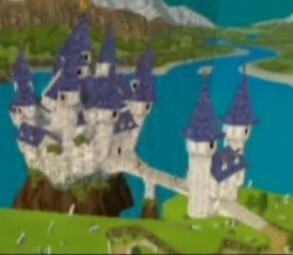 So arguably, reconstruction before The Wind Waker would take less time, approximately 50 years, compared to the 90 years it took Tetra to build Hyrule Castle from scratch. Daphnes Nohansen Hyrule is the reigning king of ancient Hyrule at the time of The Wind Waker. Based on his knowledge of ancient Hyrule, Ganondorf specifically, and the comparatively short reconstruction era of Spirit Tracks, it is probable that Daphnes was the reigning king of Ocarina of Time or at least became king soon after. In order to be king, Daphnes would likely be well into adulthood already, so he may have been approximately 40 to 50 years old. After another 50 years pass during reconstruction, King Daphnes would be 90 to 100 years old. Considering King Daphnes’ age, and the speculated life expectancy, Ganon had to return soon after Hyrule was rebuilt, with the flood very soon to follow. From this, the estimated time between the adult ending of Ocarina of Time and the flood was approximately 50 to 80 years. This closely reflects the evidence from the Reconstruction Era of Spirit Tracks, and fits within the potential age of King Daphnes. After the flood, the Hylian ancestors were forced to start over once again, and the history of Hyrule was gradually lost to most people. As suggested by the introduction, very few people from The Wind Waker remember anything about Hyrule aside from the few villagers on Outset Island. Even their knowledge seems limited since their only reference to the past was the coming of age celebration Link participated in on his birthday. Essentially, the citizens of The Wind Waker knew nothing about Hyrule’s history. This is easily understandable considering the turmoil that must have occurred after the Great Flood. All previous documentation was surely lost, so the only way to learn about the past was from word of mouth. 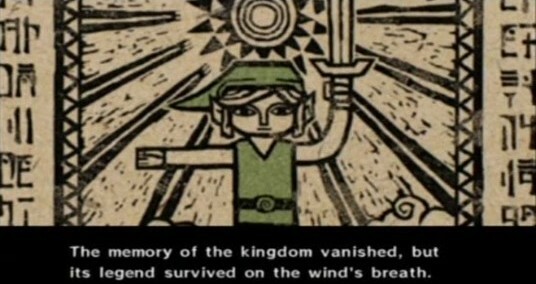 The intro says the “legend survived on the wind’s breath” which confirms one generation told the next. But after a few generations, history would become less clear and soon be lost forever. For this total loss of history to happen, a minimum of three generations must occur. The original survivors of the Great Flood obviously knew their past. When they raised their children, the kids probably had at least a vague idea of what had happened, even if their parents avoided talking about it. But by the third generation, parents may or may not have wanted their children to know their past. From this generation forward could be a potential time that The Wind Waker began. With the life expectancy estimate, and the minimum of three generations, approximately 120 to 170 years passed after the flood and before The Wind Waker. This third generation would be the age group of Link’s Grandmother, as she is one of the older residents in The Wind Waker, and conveys no real knowledge of Hyrule’s past. Within her lifetime, she had children which appear to have died young, due to their absence from The Wind Waker, but not before giving birth to Link and Aryll. Overall if 50 to 80 years occurred between Ocarina of Time and the flood, and 120 to 170 years occurred between the flood and The Wind Waker, then the minimum timeframe, between Ocarina of Time and The Wind Waker, would be approximately 170 to 250 years. This is only a minimum estimate because the time period between the flood and The Wind Waker can be expanded to include several more generations, and still fit within the 900 year cap set by the developer and in game quotes. However, unless there is a future Zelda title to take place or reference this time period, there is no need for such an unnecessary gap in Zelda history. Now that there is a vague time table set for this period, a detailed look may explain what happened to ancient Hyrule. Ganondorf’s return to Hyrule, after Ocarina of Time, probably did not result in such a sudden takeover as before. Defense in Hyrule was probably taken much more seriously after an embarrassing defeat from before. This clarifies why the Hylians were able to wait for the Hero of Time to return. To their disappointment he did not come, so they prayed to the Goddesses. If Ganon overtook Hyrule quickly, this realization that Link wasn’t coming would not have occurred. Still, Ganon’s forces eventually broke through the castle defenses where Hyrule’s losing battle continued. Somehow, Ganon’s forces are mysteriously frozen in place mid combat, perhaps allowing the remaining survivors to escape. Ganondorf later reveals the Master Sword was the key for these actions, explaining why his minions are released after the new Link retrieves the Master Sword hundreds of years later. The survivors of Hyrule climbed to the mountain tops as the Goddesses drowned the rest of Hyrule. Because there were so few mountains in Ocarina of Time, the Goddesses likely had to create several new mountains moments before drowning Hyrule, which later became the numerous small islands seen in The Wind Waker. Outside the castle of the sunken Hyrule, there are several unnatural mountains in the horizon that could likely make up these islands, strongly supporting such a divine intervention. So the survivors of the Great Flood take refuge on the newly made mountain tops. After just rebuilding their society, following Ganondorf’s initial attack on Hyrule, they must once again start over. What little population they managed to remake, after Ocarina of Time, was suddenly split between several islands. Everything they owned was destroyed, and they were stranded on separate islands with only a handful of other people. There’s no rescue boat coming to save them. This is the life the Goddesses left for their people. One couldn’t help but resent the Goddesses. 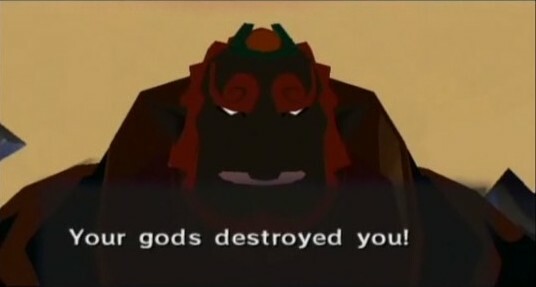 Many probably shared Ganondorf’s disgust with the Goddesses for what they had done to Hyrule. Perhaps this alone forced the loss of history. Parents probably did not want their children to acknowledge the Goddesses after they took away so much from them. The resentment towards the Goddesses likely severed this link, separating the Hylians from the Goddesses. Probably out of spite for these attitudes, the Goddesses removed their pointed ears, visually signifying the end to the Hylian race and the end of their once sacred bond. This explains how the majority of citizens within The Wind Waker do not have pointed ears. The few long eared survivors that remained must have still been loyal to the Goddesses, but are now nothing but a remnant of the lost society. Despite all their misfortune, the survivors were probably pretty good at starting over at this point. Shelters were made, boats were built to connect each island, and the population size picked up once a society was established. Still, for the first few years, their primary goal was survival, and the key to survival is food. As Ganondorf points out, the flood killed off the fish, making fishing impossible. The Fishmen in the game seem to contradict his claim, however, it is apparent that the King of Red Lions made some sort of deal with them so they would help Link. Perhaps the King of Red Lions assisted in their survival over the other fish. The Fishmen seem largely unknown to most people, so they are unaware to fish for them. Of course this brings to question how they continue to survive, since they cannot live on Link’s bait alone, but perhaps this is somehow apart of their deal with the King of Red Lions. But without any normal fish from the oceans, the survivors of Hyrule needed a different source of food to survive. Land space was limited, so agriculture would be incredibly restricted. Pigs play a regular theme in The Wind Waker, which likely explains their source of food, livestock. In order for a society to truly thrive, they will need a currency of sorts to easily perform trades. The Rupee is still a working currency, so once sailing became common, an economy could develop. Windfall became the central hub for trade. While the low population level would still be difficult to overcome, there was still likely someone to trade goods with. The Gorons seemed to have the biggest advantage in regards to trade. While their home is beyond the borders of the game, they manage to have several merchants able to trade and deliver supplies longer distances than any of the Hylian descendents. This could be attributed to the fact that the Gorons already lived on Death Mountain before the flood. While Death Mountain isn’t specifically marked on The Wind Waker map, the mountain top probably became an island, leaving their home almost untouched by the flood. Such an advantage would explain their success in trade, since they could focus on goods and transportation rather than worrying about survival. Spirit Tracks may suggest that the Gorons found new Hyrule during this time and made it their home. Their village and population size is noticeably larger than that of Hyrule Castle, suggesting a longer residency. 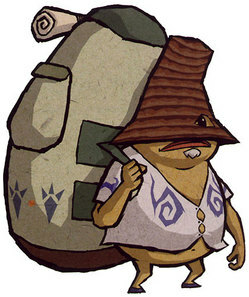 Their habits of trade in Spirit Tracks further compliment their behavior in The Wind Waker. In Spirit Tracks, the Gorons possess two of the more advanced trade items including iron, a comparatively advanced resource, and dark ore, a rare resource sought after by treasure hunter, Linebeck III. 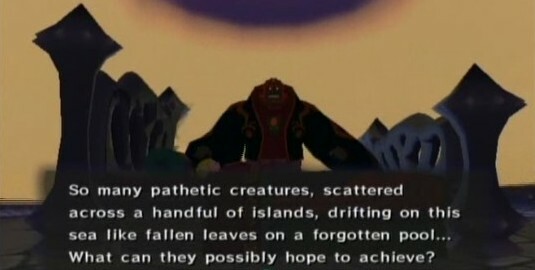 In The Wind Waker, the Gorons main export consisted of mostly flowers, suggesting the use of agricultural fields. The land required for such production would be impossible on a mere island, but the massive open fields of Spirit Tracks would provide more than enough room. So it is plausible that the Gorons found the new Hyrule during the Reconstruction Era, moved their village, and began establishing their trade routes through Windfall. The Zoras were likely much less fortunate. While Laruto suggests that some Zoras survived the flood, the lack of fish in the ocean would advocate that most of the Zoras died. One would think more water would be beneficial to the Zoras, but so much water so quickly is deadly. Zora’s Domain would be under hundreds of feet of water, so any living thing left down there would be crushed by the water pressure. The Zoras that made it to the surface have a different dilemma altogether. 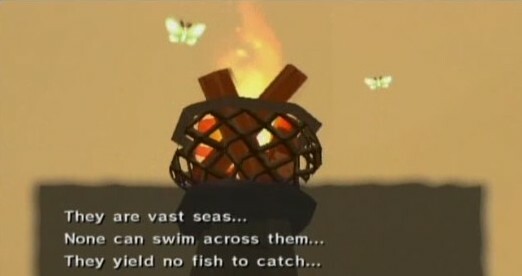 Ocarina of Time suggested that the Zoras’ main source of food is none other than fish. Knowing their primary source of food is fish, the Zoras would starve without them. Such a rapid change in sea level would destroy a fish’s ecosystem, promptly killing them off as Ganondorf indicates. With nothing left to eat, the race would starve. Their only other option is to seek help, but each race had their own problems, so the Zoras were mostly on their own, and had to quickly adapt to the situation to survive. The Rito are widely considered to be descendents of the Zoras. Medli is a Rito who is the descendent of Laruto, a Zora. Whether or not their connection is biological may be debatable, but this could explain what happened to the Zoras. Of course the idea of a Zora evolving into a Rito contradicts the given time period, since it would take hundreds, if not thousands, of years for this to happen. While Valoo’s origin is unknown, his ancient Hylian dialect suggests he predates the flood. Since a single scale grants a Rito wings, perhaps Valoo possesses the power to change the Zoras. His own scale creates feathered wings for the Rito, so perhaps Valoo could turn the Zoras’ scales into feathers. This would explain why the Rito honor Valoo, since he literally became the Zoras’ savior from their own extinction. The home for the Rito, Dragon Roost, is often speculated to be the top of Death Mountain. 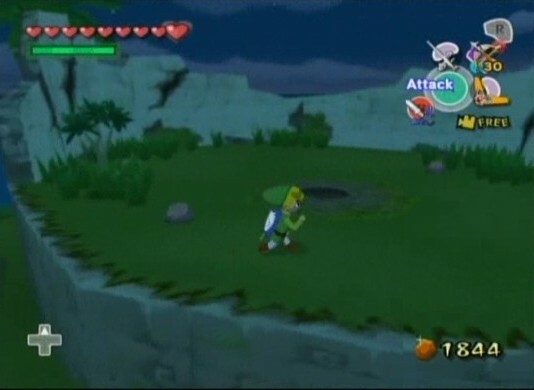 According to the Ocarina of Time overworld map, and the location of Hyrule Castle beneath the ocean, Dragon Roost is approximately located where Death Mountain should be. This suggests that the Zoras may have lived with the Gorons initially after the flood. By the time the Rito replaced the Zoras, the Gorons had likely left for their new home, leaving Death Mountain to the Rito. When Link first arrives at Forsaken Fortress, Tetra mentions a rival pirate gang used to convene at that location. 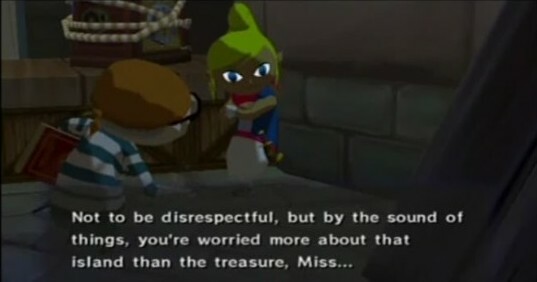 Since Ganondorf and his minions resided within Forsaken Fortress at the time, Tetra was likely referring to the Gerudo Thieves, who were closely related to Ganondorf. The Gerudos were the only missing race from The Wind Waker, and the similarly named Gerudo’s Fortress, from Ocarina of Time, and Forsaken Fortress support this connection. At the end of Ocarina of Time, the Gerudos were left leaderless. Any Gerudo that remained loyal to Ganondorf were now powerless, and the Gerudos that may have stayed loyal to Nabooru were leaderless as well since Nabooru took up the role as a sage. While there is little to speculate off of for them before the flood, it is likely that after the flood, the Gerudo Thieves did what they do best and stole from the other Hylian survivors. During the early post-flood reconstruction period, the Gerudos, like everyone else, desperately needed resources to survive. The mountain top island they occupied probably did not offer the supplies necessary to support their numbers, so they stole from other survivors. Being the most militaristic race to endure the flood, there was very little that could rival them. With no law or authority to protect the Hylians, the Gerudos could easily become the notorious pirates mentioned by Tetra. 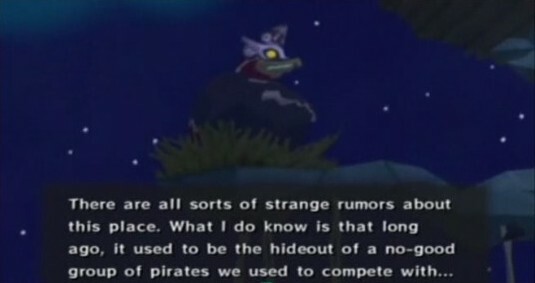 This theory is further support by Majora’s Mask, where the parallel Gerudo are referred to as pirates. Desperate to protect the lives they had salvaged from the flood, the Gerudos began construction by carving stone from the mountaintop, gradually shaping it into the new Gerudo’s Fortress. Initially, it was likely quite easy to find desperate young men willing to cooperate. A small lonely island with only a few other survivors would most likely get very lonely. As society began to turn on the Gerudos for their crimes, the Gerudo likely had to take more drastic actions. For instance, in exchange for a gentlemen’s assistance, their homes will remain un-pillaged. But without Ganondorf, and their rising level of infamy among the other races, the Gerudos were soon unable to replenish their numbers. Out of desperation, the Gerudos were forced to dig into their past, or face extinction. The Goddesses succeeded at stalling Ganon after his return to Hyrule, but it would not last forever. The Master Sword had locked Ganon’s forces inside Hyrule, and the Goddesses trapped Ganon within the barrier of Hyrule beneath the ocean. While it is unknown exactly when Ganon’s Tower was constructed, Ganondorf was alive and well, and appeared to be busy. 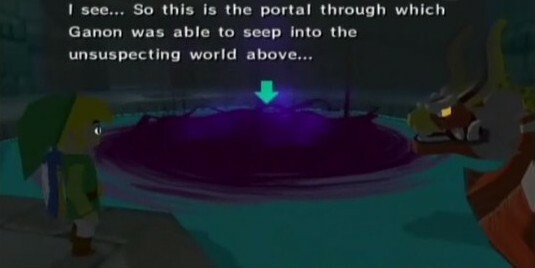 Ganondorf eventually found a way to pass the barrier and reach the surface through a dark portal, opening an entrance to the Gerudo’s Fortress. Likely arriving during their time of need, the Gerudos welcomed their former leader with open arms. With most of his army still trapped in Hyrule, Ganondorf slowly built a new militia and began his search for the Triforce and the new sages. Out of desperation, the other survivors had to quickly turn to war in order to overcome this new threat. While Ganondorf’s presence probably remained secret, Moblins slowly made their return to the world, along with the already looming Gerudos. Hylian survivors began to arm themselves out of self defense, and the art of war builds itself back into society. It is this time that men like Orca were brought up, and taught how to fight. With the slow return of Ganon’s forces, men like Orca began to covet the Knight Crest, which fabled a powerful sword technique he sought after for his entire life. As the fighting spread itself throughout the new world, the scars of war began to surface, as seen in The Wind Waker. Link’s missing parents suggest an untimely death possibly caused by the conflict during this period. Scattered islands depict destroyed buildings or ruins also suggesting a recent struggle. Not to mention all the rafts, boats, submarines, and several outposts all on top of Forsaken Fortress. This equipment was not assembled overnight just to battle Link. The Gerudos probably took a huge role in developing this war machine for Ganon, while he rebuilt his Moblin army. With so much equipment, and signs of struggle, this small war quickly escalated itself turning the fate of the remaining races into a battle for survival, one that the Gerudo would eventually lose. While Ganon’s forces recuperated from the flood, Hyrule’s forces recovered as well. Before the flood, Daphnes tried his best to protect his vulnerable kingdom from Ganon’s return, but in the end his efforts were futile. As it became more evident that Hyrule would not hold and the Hero of Time was not coming to their rescue, the King began to make preparations for defeat. Knowing that Ganon would come after Zelda, the King took a piece of the Triforce of Wisdom for safe keeping. If nothing else, the Triforce would become that much harder for Ganon to take. The sages likely took a prominent role in the final days of Hyrule. Being closely connected to the Master Sword and the Hero of Time, they were likely the first that realized Link would not return. After pleading with the Goddesses for aid, they learned of the Great Flood and perhaps helped provide Hyrule with an opportunity to escape. As Ganondorf says in The Wind Waker, the Master Sword was the key to locking away his minions within Hyrule Castle. This is how the minions within Hyrule Castle were all stuck in a frozen colorless state. This isn’t the only time such a thing has happened. 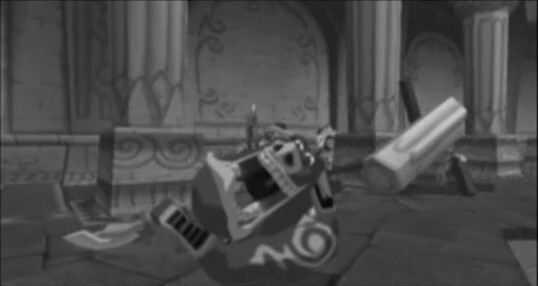 In A Link to the Past, after several strikes with the Master Sword, Ganon is frozen in a colorless state, providing Link the opportunity to shoot him with the silver arrows. In the conclusion of The Wind Waker, Link stabs Ganondorf through his skull, turning him into stone, which is not too different from the other examples. 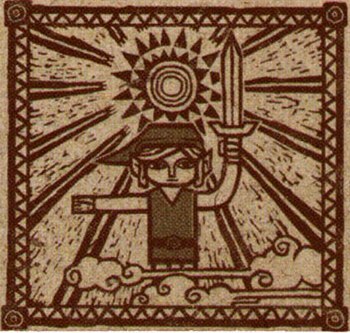 The Master Sword has the power to banish evil, which seems to include this power to stop evil beings in place, or even turn them into stone. The power of the Master Sword is also temporary, requiring the sword to be recharged. In Ocarina of Time, after each sage was rescued, they lent their power to Link, by giving him a medallion. These medallions were perhaps channeled through the Master Sword, in order for Link to defeat Ganon. In The Wind Waker, it appears this charge from Ocarina of Time was out. The frozen state of Hyrule suggests that the Master Sword was used, but in a unique way, affecting the entire castle rather than a single person. This extraordinary event left the Master Sword empty, requiring the new sages to recharge the Master Sword again, years later. Since the Hero of Time was not present just prior to the flood, someone else must have utilized the Master Sword. The sages appear to carry a divine power over the Master Sword, so it is possible that they were the ones to use the Master Sword, in Link’s absence. After unleashing the Master Sword on Ganon’s Forces, the Hylians escaped the castle, just before the Goddesses flooded the earth. Since the sages were unable to repower the Master Sword, they likely fell to the flood or perhaps Ganon himself. Daphnes drowned with the rest of Hyrule as well, like a captain going down with the sunken ship. Filled with regret for his kingdom, the King found new life in the form of a boat. It is unsure how the King was granted this second chance, but the Zelda series has often extended the lives of the fallen that left with unfinished business. The Hero’s Shade from Twilight Princess and Darmani from Majora’s Mask both shared a similar fate as the King. Taking the form of The King of Red Lions, Daphnes began his search for the Hero of Time in hopes of avenging his fallen kingdom. Right after the Great Flood, two new sages are awakened, Laruto and Fado. This must occur very soon after the flood because the original sages are gone, Laruto is still a Zora rather than a Rito, and Fado is still a Kokiri rather than a Korok. How they were awakened is unknown, but perhaps the King of the Red Lions had other objectives than just finding the Hero of Time. Once awakened, these two sages sought access to the former temples in order to repower the Master Sword. Ganondorf became aware of their presence and put a stop them. Filled with regret for their failure to restore the Master Sword, the sages remained behind, much like the King, waiting for their descendents to reveal themselves. 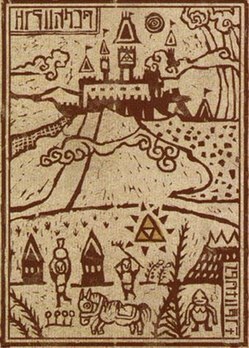 While the fate of Princess Zelda is unknown, her lineage survived the flood in order to pass on the Triforce of Wisdom. Keeping in mind the three generation minimum discussed earlier, Tetra never met Princess Zelda, since Tetra had no idea of her destiny. However, Tetra did know a lot more about Hyrule than others. Within Tetra’s quarters in the Pirate Ship are several pictures on her walls. There is a recycled picture of Hyrule Castle also seen in the introduction to the game, which indicates that Tetra did know something about Hyrule and the events of Ocarina of Time. 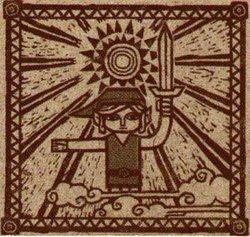 Another picture depicted the Hero of Time wielding the Master Sword, also seen in the introduction, meaning Tetra knew of him as well. There is also an image of a dark haired woman. This woman is likely either Tetra’s mother or guardian, and the original captain of her ship. Tetra may not have been raised to fully understand her past, but one thing that was well established was her willingness to help what was left of Hyrule. The descendents of the original Princess Zelda’s tenants became the crew of the pirate ship. While Tetra’s mother knew of her destiny, the initial goal of the ship was to conceal and protect Tetra’s true identity, even from herself. This may have worked initially, but the pressure of the growing Gerudos army changed their plans. If the Gerudos continued to pillage every island, there soon wouldn’t be anywhere left to hide. This forced them to go on the offensive against the Gerudos, and Ganondorf’s growing army. Being so outnumbered, the crew likely had to engage in less than honorable tactics in order to significantly fight back. Since no known Gerudo was left by the time of The Wind Waker, this may indicate the crew killed a number of Gerudos. This may have turned their ship infamous and developed their persona as pirates. Many likely feared the pirates, being unaware of their good intentions, and they soon became black listed, forcing them into dirty deals and money gouging. But these sacrifices needed to be made for the greater good, or perhaps to further conceal Tetra’s identity. This is likely how Tetra shaped her personality, based on such behavior. 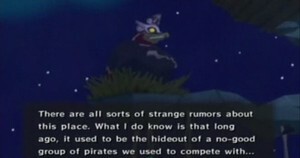 While loosely learning about her past from her mother, being a pirate was the most important to Tetra at the time. At some point, Tetra’s mother dies, likely from the conflict with the Gerudos. Tetra takes the role of captain at a surprisingly young age, and continues the war. With the collective strength of Tetra’s crew, Orca, and all the other citizens who fought back, the Gerudos and their already dwindling population were thoroughly defeated. With the Gerudos mostly gone, and the rise of the Moblin, Gerudo’s Fortress was appropriately renamed to Forsaken Fortress. The untimely death of her mother probably left Tetra with several unanswered questions about her past, since parts of it were kept from her on purpose. After inheriting her mother’s necklace and the gossip stones, Tetra decided to look into her past. 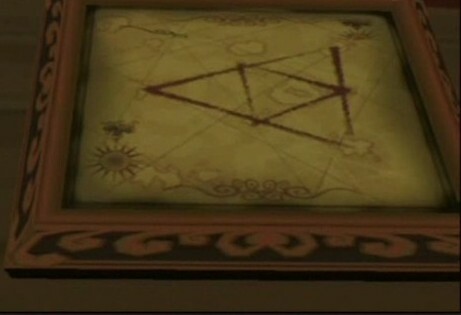 The final picture in Tetra’s cabin is a sea chart, outlining the three locations of the Goddesses’ Pearls. Drawn in between is the Triforce, suggesting that Tetra knew about the Tower of the Gods, and the access to Hyrule. Once the Helmaroc King expressed his interest in Tetra, she knew the war with Forsaken Fortress must continue, and to do so, she needed the Master Sword, even if the Hero of Time was not there to use it. After an unsuccessful run against Forsaken Fortress, and what she assumed was the unfortunate demise of Outset Islander, Link, Tetra decided to shift her interest back to the Master Sword. Her first stop was Jabun, the keeper of Nayru’s Pearl. After finding Greatfish Isle utterly destroyed, she knew she had to find him quickly before the pearl was lost for good. Upon hearing that Jabun was secretly relocated to Outset, her duty to protect the innocent chimed in for her to realize that Outset needed to be evacuated immediately. Confused by her motivation, the pirates even comment on her concern for Outset over the rumored treasure. After essentially letting Link find Jabun first, she later met up with Link in Forsaken Fortress. To her surprise, Link actually found the Master Sword. She even questioned him in disbelief. 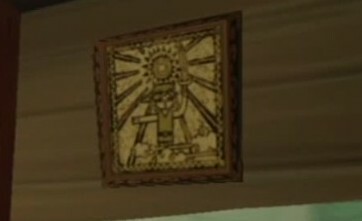 From this point on, she knew Link was somehow connected to the Hero of Time, like the picture in her cabin. It wasn’t long before Link takes Tetra down to Hyrule to meet King Daphnes for the first time, where her true identity is finally revealed. With such a rich history, it is sad to see so little of it survive the flood. While it is intriguing to interpret each little piece, the full backstory can only be speculated. This is the first time Hyrule completely collapse because Link was not there to intervene, but because of the flood, the story was almost missed entirely. Then again, it is quite sad to see Hyrule fall. In Ocarina of Time, Link worked so hard to stop Ganondorf, but for The Wind Waker, his efforts were in vain. In other titles, Link’s efforts weren’t a complete success either, since Ganondorf will always return, but never before has Hyrule totally fallen. The Wind Waker is full of mysteries that may never be solved. The backstory featured the return of Ganon, the fall of Hyrule, the Great Flood, the complete reconstruction of society, a total loss of Hylian history, and the rise of the new princess all within a few hundred years. With the estimated life expectancy of 100 to 150 years, as established by Spirit Tracks, the Reconstruction Era took approximately 170 to 250 years. This helps more accurately interpret the events that took place in this time period. While one can only speculate on all the minor details, there is clear evidence of a well developed story, full of turmoil and confusion, giving The Wind Waker a far deeper story than what many initially thought.